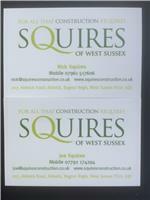 Squires Construction - Builder, Swimming Pools based in Bognor Regis, West Sussex. Squires Construction is a family run business. Squires Construction work very well as a team which produces efficient and quality skilled work. We are a family run business with a combined experience of 40 plus years. We price fairly and work hard and we are a very clean and leave no mess. I have spent 6 years at college to get my NVG in brickwork, my First Diploma in Construction and my National Diploma in Construction. Nick Squires has been in the industry since he left school and has learnt many skills and depth of knowledge within the construction industry. We can be a 2 and 1 team or more.